Construction of new inland port approved in the Carolinas I-95 Mega Site. Inland Port Dillon will be diversification of South Carolina's logistics footprint. Inland Port Dillon initial build out expected to accommodate 45,000 containers annually. The South Carolina Ports Authority announced plans to develop a second inland port in Dillon, South Carolina, to support growth of intermodal container volumes and expand access to markets in neighboring states and throughout the northeast and midwest. The SCPA Board of Directors unanimously approved a resolution authorizing the port to move forward with construction of the terminal in the Carolinas I-95 Mega Site. SCPA will break ground on the new terminal in the first quarter of 2017 and plans to open the facility by the end of the year. Located in the Pee Dee region of South Carolina, the site was selected for its proximity to I-95, a critical transportation artery in the Southeast, as well as a significant base of existing port users in the area that represent base cargo opportunities for the facility. The site is served by an existing CSX mainline, which provides overnight access to the Port of Charleston. With 166 percent growth of SCPA’s intermodal volume since 2011, demand for such inland facilities has increased rapidly. 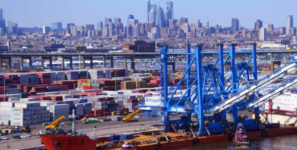 A study of the market potential and proposed terminal layout was completed since the SCPA first announced its consideration of the Dillon site in April. The port will now move into the design phase of the project, with the initial terminal build out expected to accommodate 45,000 containers annually.